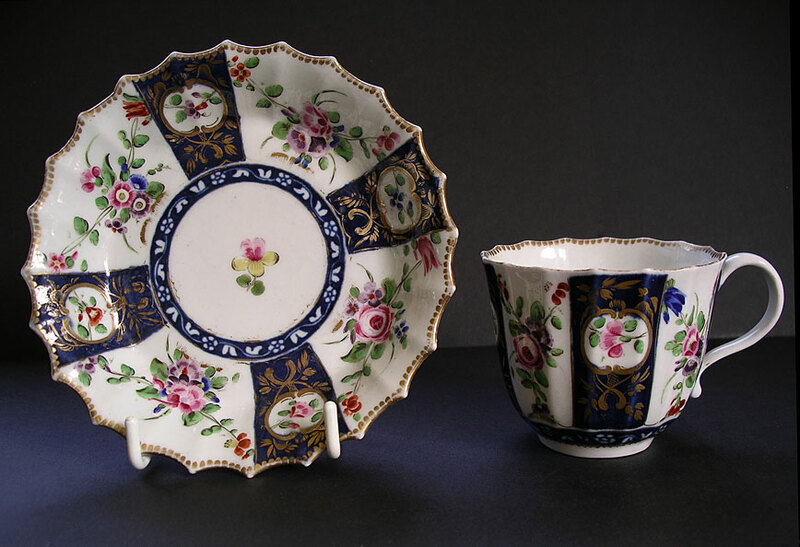 "A fine, desirable, hand painted polychrome Worcester English porcelain fluted cup and saucer dating from c.1768-75. Examples of this particular Worcester Flowers decorative treatment are rarely found among the Worcester hand painted designs to collect. The underglaze blue and white roundel to the design usually forms the base for the Queens pattern. Also of merit here is the quality of the gilded decoration to the on glaze blue panels which would have been a costly extra to produce. This piece was once part of the F.S. 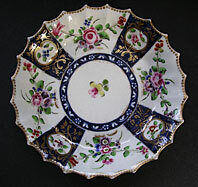 Mackenna collection of Worcester porcelain so great provenance here! Mackenna was a leading authority on English porcelain and author of a number of important published works. A charming reference and display example for the discerning collector." Antiques Expert Hamilton Bear. References: Another cup and saucer with similar decorative treatment is illustrated in Worcester Porcelain 1751-1790 The Zorensky Collection, Simon Spero and John Sandon, page 192 Cat. No. 206. There do not appear to be any other examples of this rare piece illustrated in other reference works, or in major museum collections. Dimensions: width saucer 124 mm max. height cup 60 mm max. Marks: Worcester square seal mark in blue to both pieces as illustrated. There are F.S. Mackenna collection labels to both pieces. Condition: The piece is excellent and great for display. A wonderful survivor with no significant defects. Condition report: There are a number of tiny pin head size flat shallow rim frits to the scalloped points of the saucer underneath. There is one pin head size flat rim frit inside the cup which had been gilded-in by the factory and is therefore difficult to spot. 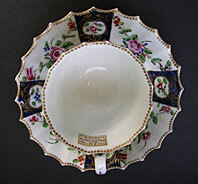 Rubbing wear to the edge of the gilded border to the points of the flutes of both cup and saucer. A small 'bubble' of raised porcelain inside the base of the cup from firing in the kiln.